Join us for a challenging and rewarding career as we grow from strength to strength delivering next generation software solutions. We are looking for talented professionals to join our team, sharing our vision to be the leading next generation software solutions provider. 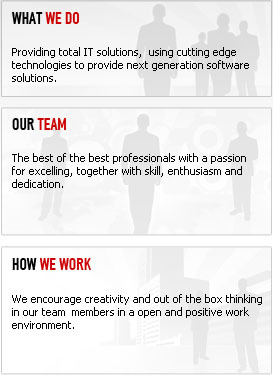 Skill, enthusiasm and dedication are what we look for in our team members. Manage medium to large software projects. Good project management skills, leadership skills and communication skills. Willing to work long hours and meet dead lines. Incorporate consulting practices, solution conceptualization and current technology concepts combined with development life cycle experience. Good communication skills both written and verbal at business and technical levels.